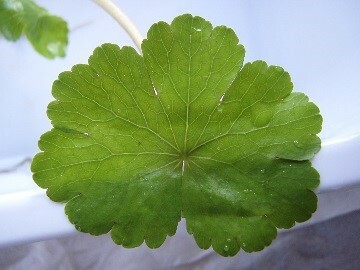 It’s green, reportedly can grow up to 20 cm a day, and can out-compete other plants and wildlife in the river. I’m talking about floating pennywort, an invasive non-native species. Originally from America, it arrived in the UK in the late 80s. It has established itself in the wild in several areas of England, probably as a result of discarded plants from garden ponds. It grows in water along the banks of rivers, especially favouring stagnant conditions and warm temperatures. Once present in a reach of a river it can establish dense mats of vegetation that can out compete native species, dominate watercourses, obstruct boats and prevent angling and potentially increase flood risk. On the River Thames, we are also concerned it could restrict operation of our weirs and locks. We have been managing floating pennywort as part of our annual maintenance programme for many years in locations such as the River Wey, Abbey River and the Foudry Brook. However in 2017, due to ideal growing conditions, floating pennywort established itself in some of the backwaters of the Thames and in some areas on the Thames itself. These are from Blakes lock on the River Kennet in Reading down to Kingston, In Autumn 2017 our area operation’s field teams did a large amount of removal work. To assist in our scaling up of the management of this issue we declared a local incident and established a Floating Pennywort Action Group (FPAG), to lead our on-going response. We have also been working with colleagues across the DEFRA group and local partners such as angling clubs, community groups and landowners to monitor and manage floating pennywort. I’ve been working in the Thames area of the Environment Agency for over a year now, having worked previously mainly overseas in a variety of operational and project management roles for water and environmental consultancies. With the rest of my team, I plan, design and project manage maintenance and minor construction works on the Thames and its tributaries, making sure that our assets are operational and safe to use and continue to reduce flood risk to people and businesses. In Thames area we have over 3,606 km of main rivers with flood defences reducing the risk of flooding to over 138,725 properties. Early intervention is the most efficient way to manage floating pennywort. Whilst we are actively working with riparian owners that are willing to manage it themselves, its prolific growth rate often means that management may not be within many landowners capabilities.The management of floating pennywort is different to other projects I have worked on. Riparian landowners (those landowners who own a stretch of watercourse that either runs on, under or is on the boundary of their land) and the Environment Agency are under no obligation or statutory duty to remove Floating Pennywort, unless it can be shown that they are responsible for planting it, however we do have discretion to remove it under our statutory powers if it poses a flood risk. 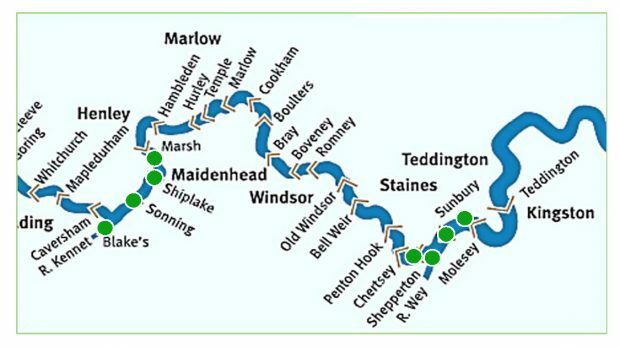 Our ultimate aim is to eradicate floating pennywort from the main River Thames. 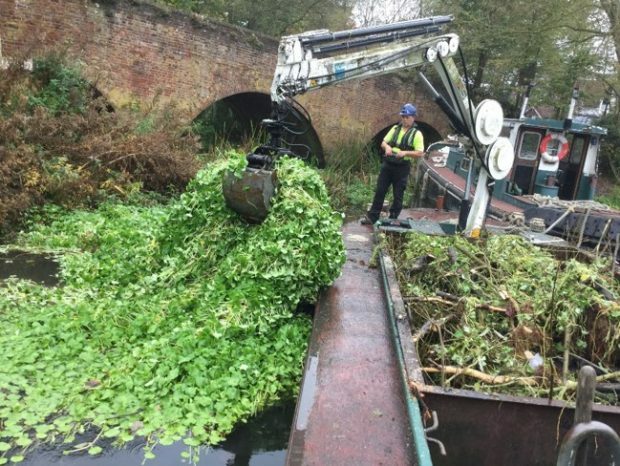 In addition to our operational field teams’ work, a specialist contractor is being appointed to survey and remove floating pennywort on the Thames and selected backwaters over the next 12 months. The contractors work will include maintaining a high level of surveillance over the summer and addressing any regrowth at known locations. On the tributaries, where it is already established and not posing a flood risk, we will continue to control it as part of our regular maintenance programme. However, if floating pennywort is found in a new location in a tributary we plan to act rapidly to remove it and prevent it spreading into the Thames. In addition, we are working with riparian owners, local stakeholders and the fishing and boating community to inform and encourage cooperation in the management of floating pennywort. This is a key part of the long term management plan. You can also report sightings using the plant tracker app. Thanks for your comment John. It should be org.uk. We will get this updated. Please give our general enquiries team a call on 03708 506 506 and we can put you in touch with one of our fisheries/crayfish team who will be able to discuss this with you further.